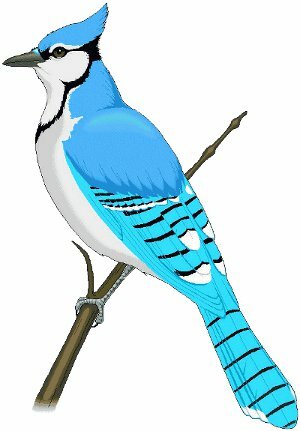 Blue jays live in the forest and are very smart birds. They live mainly in eastern part of North America. Often noisy, they make the sounds 'Jay! Jay!'. Blue jays eat acorns, nuts, and seeds along with caterpillars, grasshoppers, and beetles. Blue jays often store acorns in the ground but sometimes forget where they put them. They live in pairs or small flocks, and sometimes go south for the winter (but not always).